Sherman Dixon (left) accepts prize from McDonald’s of Southeastern Wisconsin Co-op President Robert Pyles during surprise media event in May 2012. Educators throughout southeastern Wisconsin have returned to the classroom after a well-deserved spring break. While it’s easy for many parents and students to say they appreciate their educators, McDonald’s Restaurants of Southeastern Wisconsin is partnering with Jammin’ 98.3 FM radio for an opportunity to show that same sentiment. The 3rd Annual Teacher Appreciation Contest is designed to recognize the positive impact educators have on students. Whether it’s a math teacher, coach, librarian, or custodian, the only criterion for nominees is that they be employees of an educational institution. Anyone can nominate their favorite educator by going to www.wjmr.com and clicking on the “Sing the Praises of Your Teacher” section. From there, nominators can describe why they think their educator is the best in 200 words or less. Flyer promoting the 2013 Teacher Appreciation Award. All nominations must be submitted by Sunday, April 21. All who nominate will be sent a coupon for a free Premium Mc- Wrap, a new product at Mc- Donald’s. 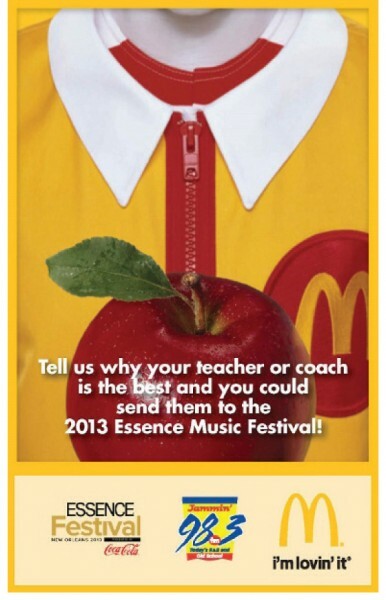 The winning educator gets a trip for two to the 2013 Essence Music Festival in New Orleans from July 4-7. Headline performers from this year’s festival include Beyonce, Mary J. Blige and Trey Songz. 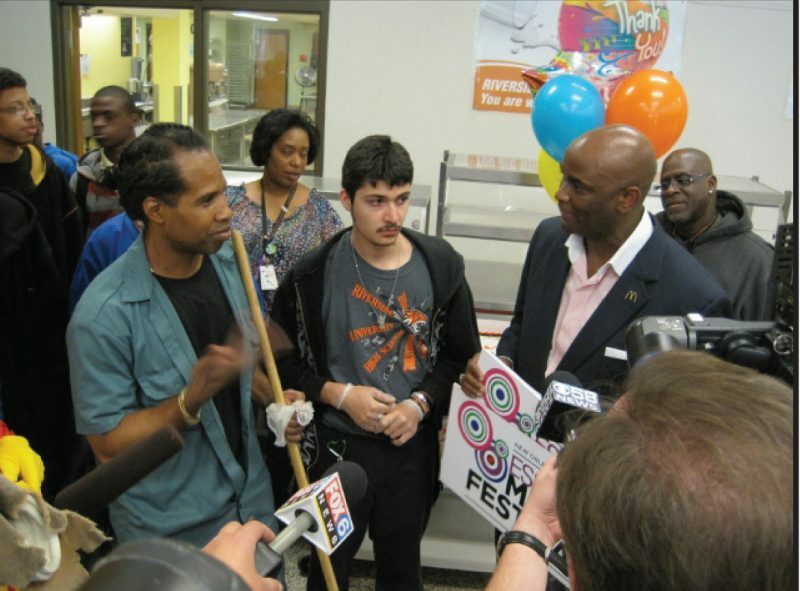 Last year’s contest winner was Sherman Dixon, a Riverside High School custodian. He was nominated by a parent of a special needs student at the school whom he worked with and his award shows that everyone in a school can be considered an educator. A surprise media event, which took place at the school with Ronald Mc- Donald, was held in Dixon’s honor where he was officially announced as the contest winner. Dixon, a former McDonald’s employee, credited hard work to his success, but also the kids he works with every day. The Teacher Appreciation Contest coincides with Teacher Appreciation Week, which runs May 6-10. The program is one of many education- related programs that are sponsored by McDonald’s Restaurants of Southeastern Wisconsin. Other school-based programs include multicultural scholarships that award $60,000 to high school seniors, McTeacher’s Night events where teachers have the opportunity to work behind the counter to raise funds for their schools and Ronald McDonald performances in elementary schools, to name a few. McDonald’s USA, LLC is the leading foodservice provider in the United States serving a variety of wholesome foods made from quality ingredients to millions of customers every day. More than 80 percent of McDonald’s 14,000 U.S. restaurants are independently owned and operated by local franchisees. For more information about McDonald’s visit www. mcdonalds.com or log on to or log on at any of the 10,000 Wi-Fi enabled McDonald’s U.S. restaurants.